I figuered I needed to add another critter to the menagerie……..meet Sheldon. He’s a sea turtle, but he is rather obsessed with all things relating to the cycle world. It is his dream to compete in the Tour de France, and he is very serious about his training and his bikes. He has the latest carbon frame model (which makes him smile just to look at) and it weighs less than a pound unfortunatly with Sheldon on it it weighs 124lbs……..if he ever thought it was his shells fault for him not being super quick, well it would just break his heart…….especially since he just paid a small fortune for a small titanium spring that is going to lighten “the bike” by 0.00000000000001 oz. Who knows if he trains hard enough you may just see him whizzing through the Paris streets soon enough. 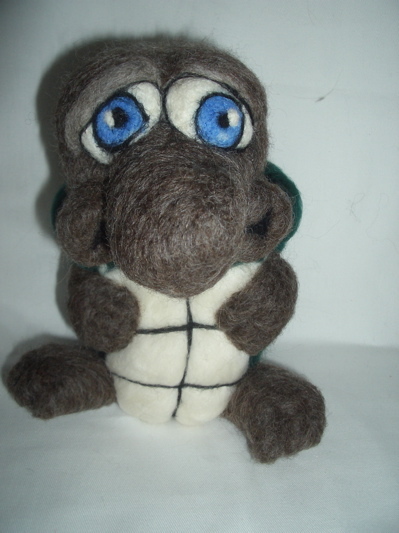 In non felting news…….I finally bit the bullet and ordered myself a sewing machine this weekend. Now this is scary for me as I’ve never owned a sewing machine before, in fact I can’t even remember the last time I used one……..eeeek. 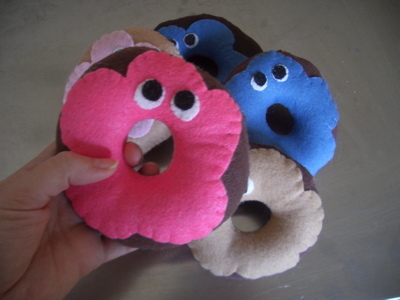 But I figuered it makes sense for me to learn as it will take the pain (and time) out of sewing my felt donuts and I can make other felt mobiles providing I can think of something else of course. Anyway I got a basic Brother and I can’t wait for it to get here. Wow I can’t believe it’s been a whole year of blogging already. I remember typing my first feeble attempt at an entry and thinking what the heck am I going to write every week……..I was never good at keeping a personal diary when I was a kid but I always really loved the idea of having a journal, so I would buy the cutest books with the resolve that this time I would successfully keep a diary. This really meant that everyone of them would have scribbles on the first couple of pages before I gave up. But I feel so accomplished with this blog……….I may mostly just talk a lot of nonsense but hey I do in the “real” world too so what can you expect? 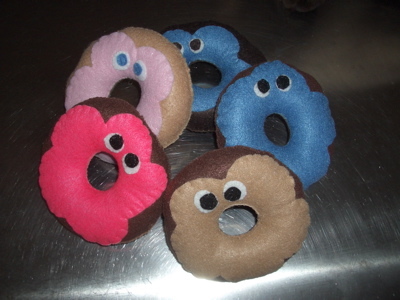 Anyway a little while ago someone suggested I make baby rattles out of my lil dunker’s and so I finally did it. 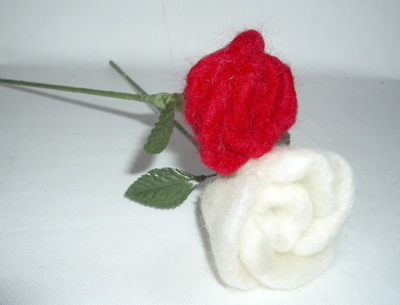 They took me ages though as I wanted to make very sure that my stitches were as perfect as possible…….I don’t want anything coming apart in a little kiddies hands……….They most likely will be heading off to Anthology this weekend with a box load of needle felted roses. I’ve called him Delerium after the yummy Belgium beer, and he’s a pretty guy even if he does make you feel a little squiffy. So this weekend was a tidy the house and organise my crafting crap kinda weekend….. something that really, really, really had to be done but I hate it so much. Which of course makes it a million times worse when I do get around to it which makes me hate it so much more, you see it really is a vicious circle. I also finally bit the bullet and got a proper flikr account, so we’ve been slowly freeing up our computer of the millions of piccies that we have stored on the hard drive onto it, it’s just a pain to try and organise everything into sets that make sense. I hate organising stuff, if it’s not the apartment then it’s the flikr……..gaaaaah, what a pain!!! I think I’m going to hang out with Delerium for a while instead. Happy Easter and Happy Birthday Mum. Making the flowers has quickly overtaken my obsession with making peepers, which as Easter is quickly approaching I guess is a good thing. 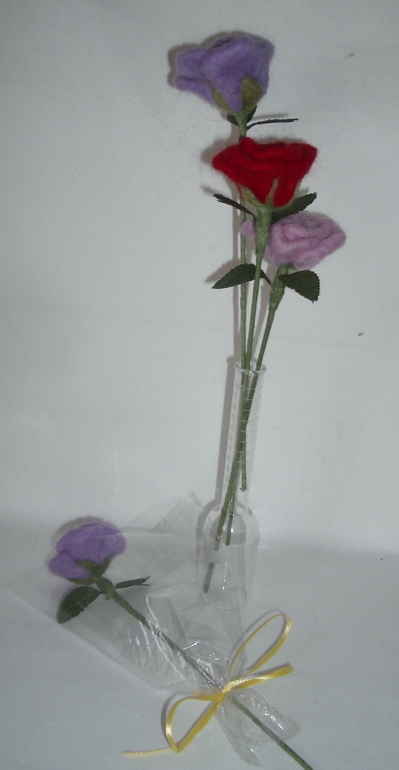 Not much else going on in critterville……just trying to come up with goodies for the shops. 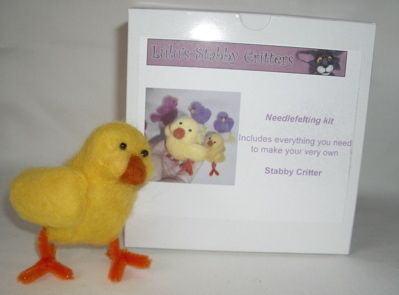 Remember I am doing a needle felting demo on April 5th at Anthology, 218 State Street in Madison at 1.00pm so if you are in the area I’d love for you to stop by and watch the stabby stabby in action. Anyway his story is that he is the unofficial helper of the Easter bunny, and by unofficial I mean no one wants Pudge to “help” in any way, as all he really does is hide the chocolate eggs in places no one will ever, ever look so that he can scoff them all himself. 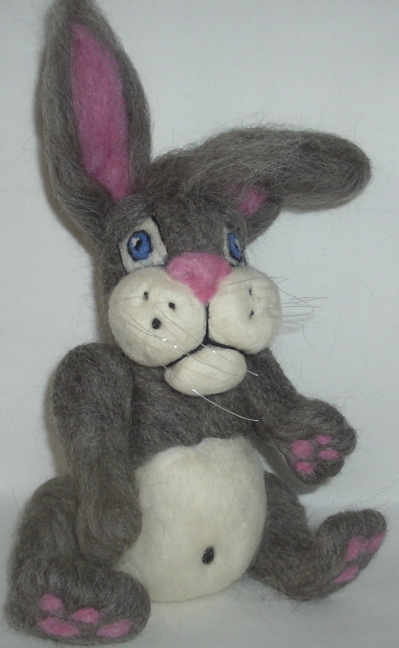 He’s not a bad bunny just a pudgey bunny with a sweet tooth. This weekend was great, we went to Madison and checked out Anthology for ourselves and it is a beautiful shop. I am so pleased to have my work there. I also had a much needed haircut at Baci, Casey did a wonderful job and I am so happy with my new short cut. So yip another fab weekend in Madison. 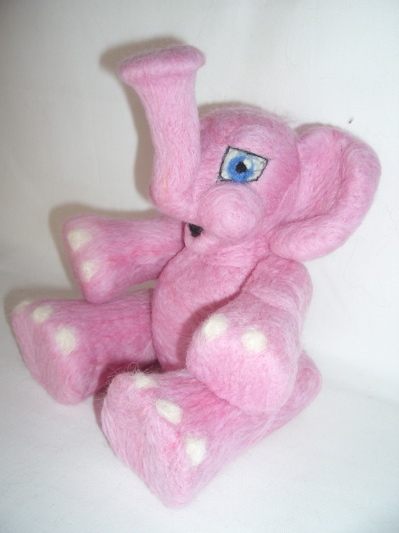 Mega cute………I always think about how to make my stuff look more appealing in photographs but never follow through with my thoughts….. anyway stay tuned to Anthology as I am going to be doing a needle felting demo there soon…….eeeek I can’t wait!!! 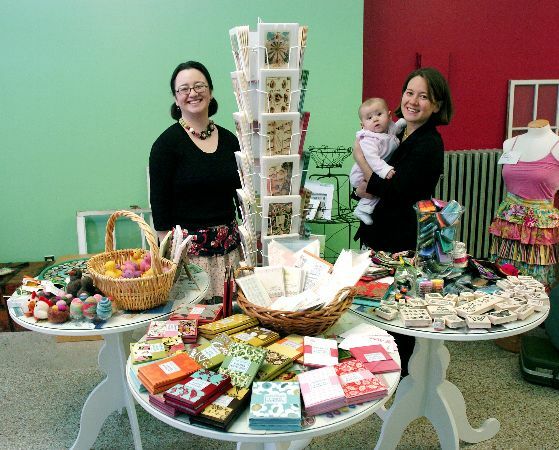 The Local Madison newspaper did a write up on the store owners and you can read it here. Another place you will soon be able to say hi to the critters is the White Rabbit Gallery in Iowa…….some of them will soon be heading on over there and needless to say they are very excited about this fact. I keep hearing them talking about it with little squeels of delight…. particulary Cyranno the pig he wants to go weee, weeee, weeeeeee all the way (to his new) home. I finally finished a new critter yesterday but unfortunatly I cannot find my camera to share him with you yet (how annoying is that?) It’s always a bad sign when I can’t find my camera…. particulary when my husband likes to take it on his bike rides for “action” shots. When I asked him about the whereabouts of the camera last night he responded that he “mighta had it”…. doh!!!! I’m guessing that we shall shortly be buying a new camera. But if it does show up I’ll post a piccie of Pudge. 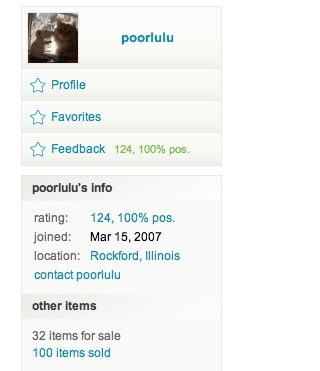 Wooohooo this weekend I reached 100 sales on Etsy………and I did it in under a year………wooohooooo. Sorry I don’t mean to toot my own horn, but I never thought when I opened my Etsy store I would ever get to a hundred sales so needless to say I am very excited about it. And of course I am very greatful to all the people who have made a purchase from the critter store….thank you so much for liking my work and supporting an independant artist, and for being wonderful of course. The problem with productivity is……. 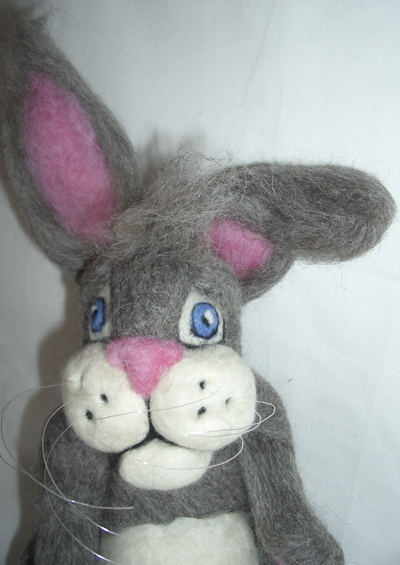 Well I am not sure there is a problem exactly but it feels like I haven’t made a critter for ages, and yet I have been busy everyday with the critter world…………..I had to remedy this asap!!!! 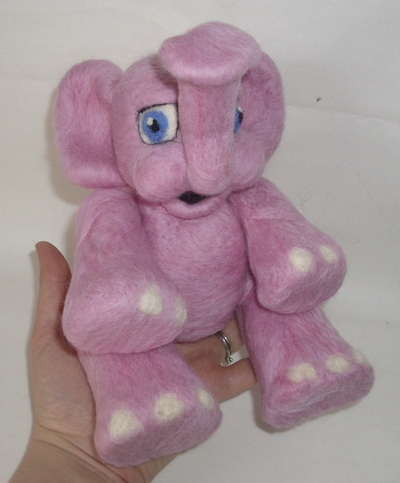 About a month ago I had Jen of hanks in the hood custom dye me some wool in pinks and purples because I had a critter in mind but then I got distracted by the peepers, which isn’t a bad thing really, I already told you how I love making them……but this is who I had in mind…. 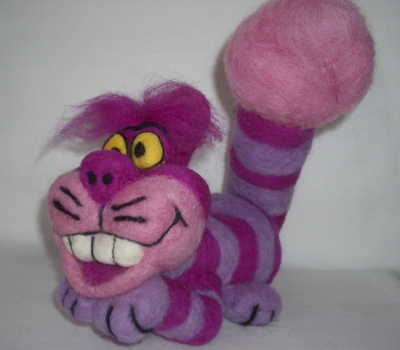 The Cheshire cat from Alice in Wonderland. 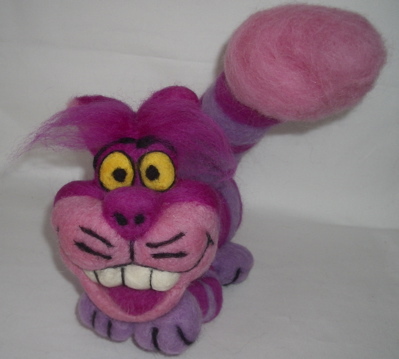 I love the Cheshire cat and have wanted to make him for ages so obviously I am very pleased with how he turned out and I already listed him in the shop. I think I really want to make some of the other characters, particularly the white rabbit and maybe some flamingos……..but we will see. And in other news I am trying to get another Art-o-Mat project completed…..it has been waaaaay to long since I sent them anything and I love being part of the project so I am trying to get on with it. Wow time goes by fast when you are having fun huh? I am genuinely very surprised that it’s March already……probably because March used to mean in my mind that Spring was coming and snowdrops would be erupting through the ground and in DC it meant the start of the gorgeous cherry blossoms at the tidal basin (and all over town). 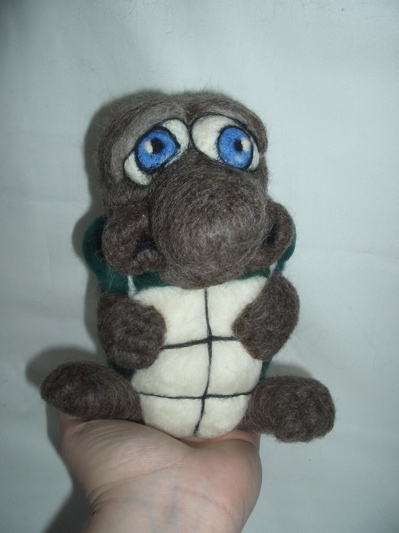 In the midwest however I woke up to another dusting of snow and the news that more is on the way……….waaaaaaaaaa. I am really addicted to making the lil’ peepers so I figuered I should document the process and make a kit, and I think it’s a great timely Easter craft too (this is so unlike me……normally I would have this great holiday idea 2 weeks after the event so I am feeling rather chuffed with myself). So it’s up in the store now. 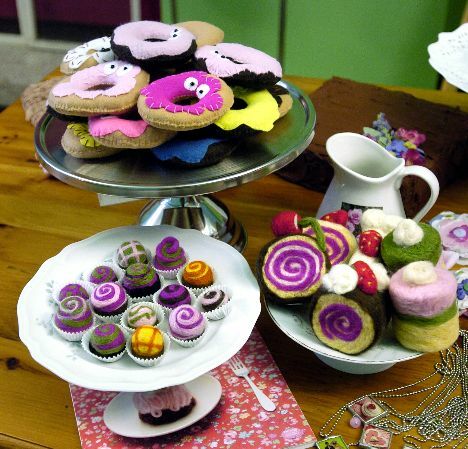 You are currently browsing the Stabby Critters weblog archives for March, 2008.